When I see travel posts about taking trains with children, it always seemed like such a fun and novel idea. Board a train, dump your bags, be able to get up at any time for a bathroom or snack break. Sounded perfect to me! 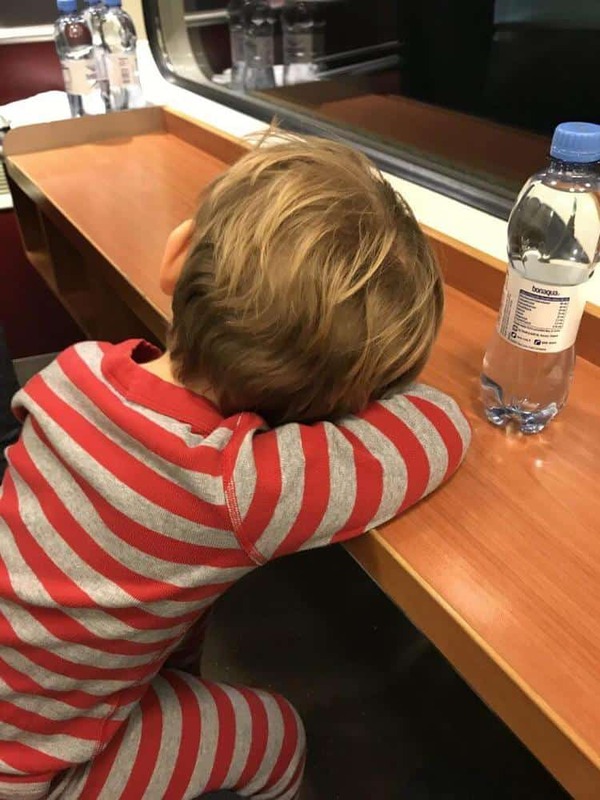 When we started booking our trip to Lapland, Finland another travel mamma posted about the Santa Claus Train from Rovaniemi to Helsinki. I was hooked! Check out all the details on the trip below. What is the Santa Claus Train? 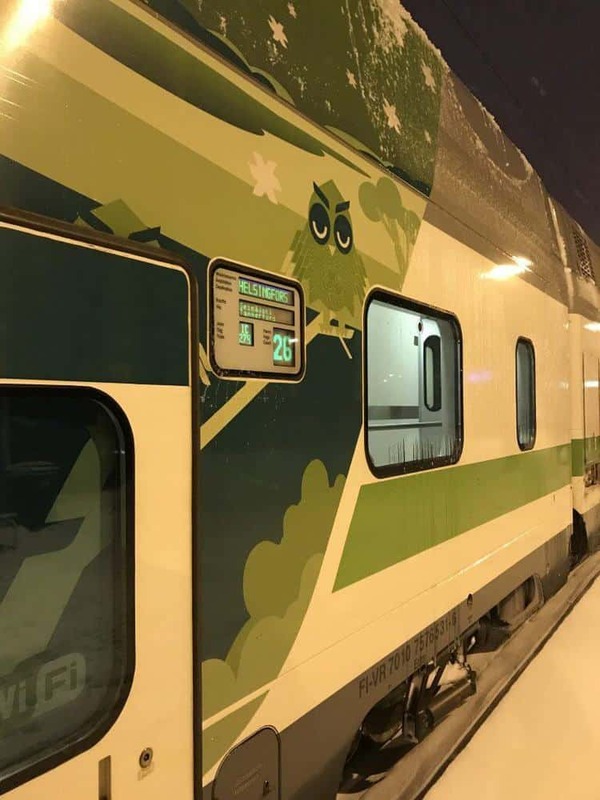 It is an overnight train from Rovaniemi to Helsinki, Finland. It takes a total of 12 hours and you can book two different cabins types. There are also two departures 7 pm – 7 am or 9 pm – 9 am. We chose the 9 pm – 9 am departure. This is partly due to the advice another mom gave me. It is much easier to keep a little one up past their bedtime than it is to wake them up and rush out of a cabin at 7 am trying to make sure you have all of your belongings. I hate feeling rushed, so the later arrival worked in our favor. We were also arriving into Helsinki, spending the day and flying out that night, so we didn’t want to be trying to find something open at 7 am. You aren’t able to book online, which is unfortunate. Here is the link to more information about the train, but you’ll need to call the Finland based number. Do not call the US-based number because they want to charge you to mail your train tickets, which isn’t necessary. So call Finland directly. Finnish Railways (VR) customer care (+358 9 2319 2902). The easiest way to call internationally is to sign up for a google voice number. Then add some money to your account and call from your computer. The reservation line is great and the attendants speak perfect English. How much does the train trip cost? You have two different options for sleeper cabins. 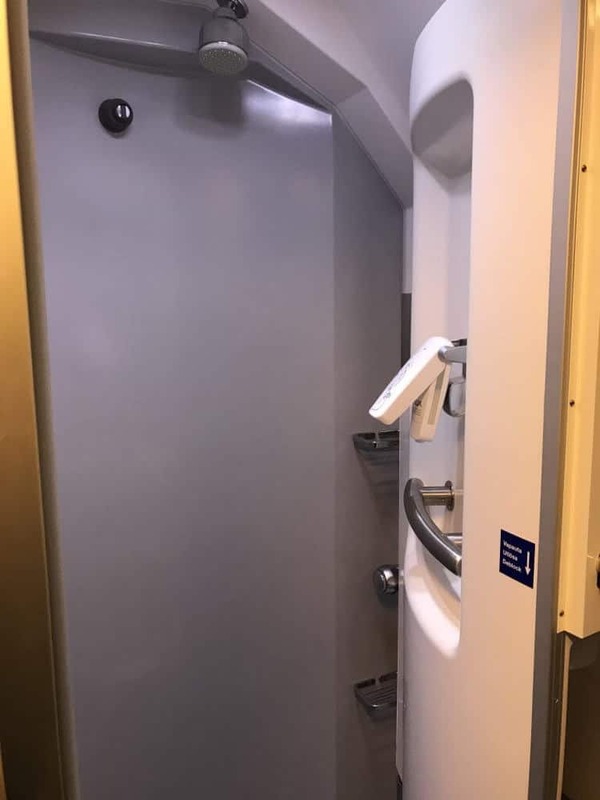 The sleeping cabins without private bathrooms (shared bathroom in the hall) are located on the bottom level of the train. 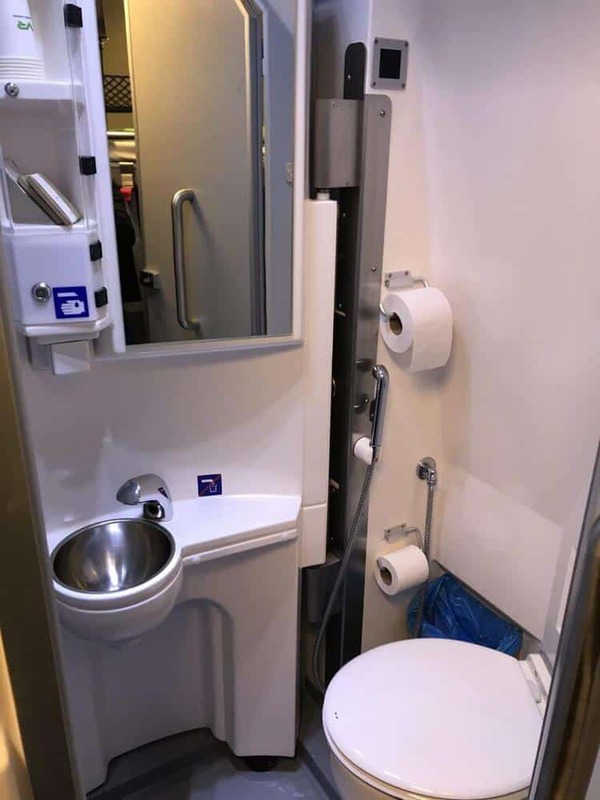 the sleeping cabins WITH a private bathroom are located on the top level of the train. You can also request adjoining rooms (only available for standard sleeper cabins on the first floor) for families with multiple children. You’ll make a reservation for one adult per double cabin and then the children can use the existing beds. They also have single seats, but it’s a 12-hour journey, so I would only book this if you are budget conscious. One of my favorite parts of the Santa Claus Express Train was that children 10 and younger are able to travel free of charge as long as they are occupying the same sleeping compartment as their parents. You must tell the reservation line when a child is traveling with you. They will issue tickets for children 4-10 years old for FREE. 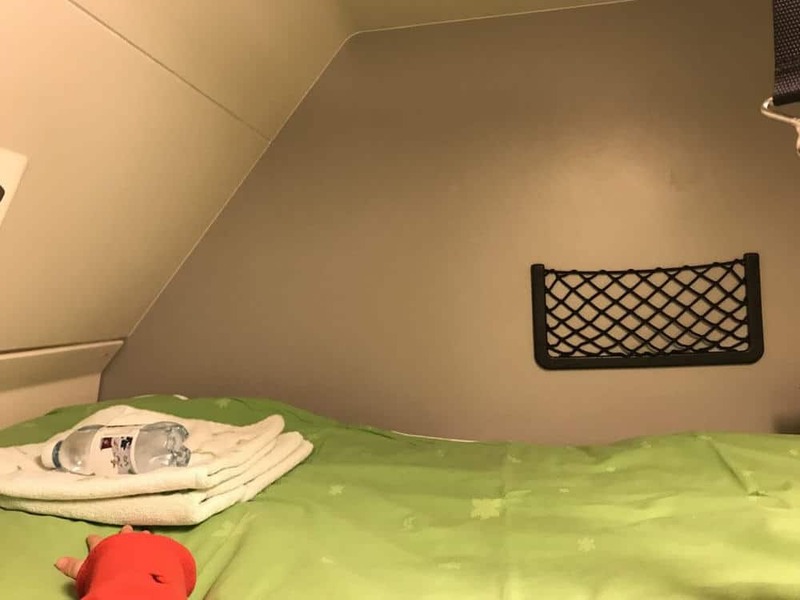 We ended up booking a deluxe (with a private bathroom) sleeper for our family of three. Children must occupy the same bunks as the parents, and there are only two bunks, more on that later. Each sleeper car features a bottle of water per ticketed customer, one pillow and one blanket/comforter. Upper bunk with bottled water and towel. Sleeper cabins with a bathroom feature a space-age bathroom that transforms from a sink and toilet to a full-size shower. Just open the wall and voila! Hard to photograph, but really cool! We took the train only one way, from Rovaniemi to Helsinki, so I can only speak to the boarding process at this station and in this direction of travel. the station in Rovaniemi is rather small, but it features a small gift store and cafe for any late night snacks. Another nice benefit, if you rent from Hertz, you can drop your rental car off at the train station (key drop box). 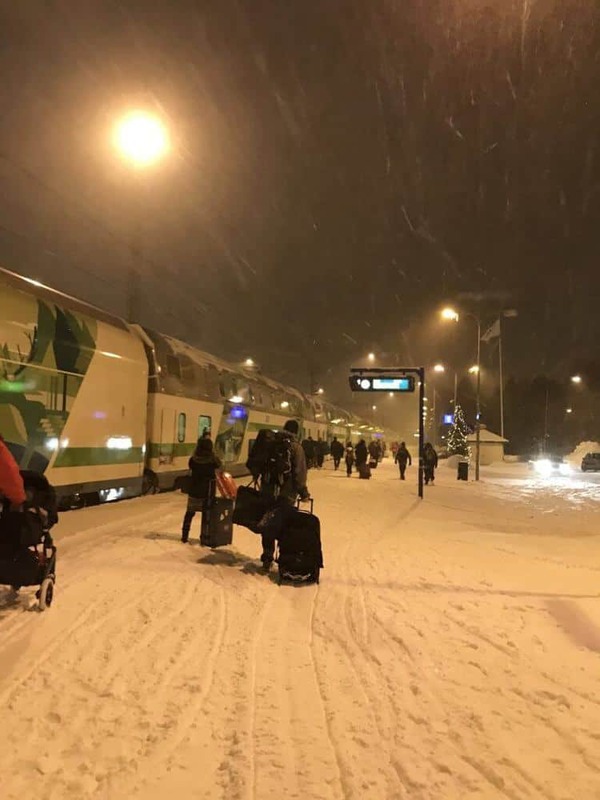 This was perfect for us because we didn’t want to deal with the hassle of dropping the rental car off at the Airport and then making our way to the train station with luggage, a small child and lots of snow! We like to arrive relatively early in order to scope out the station, use the restroom and be ready for departure. The train boards 10-15 minutes before it leaves, so be ready. When it is time to board, the staff will announce the arrival of the train. Check your tickets so that you know which train car and which sleeper room you have a reservation for. My husband hauled the bags, I was responsible for the little one. This is where packing light comes in handy (even though we didn’t really follow this advice). 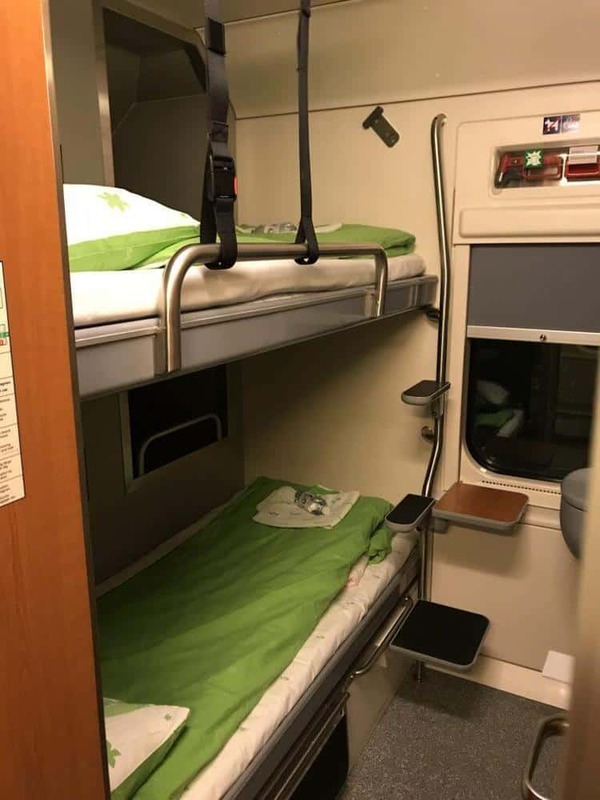 The sleeper cars are small and we didn’t see a luggage room to store your items. That means everything you have will be in the room with you. My husband hauled the bags up the stairs into our room and we shoved the bags into every spot we could find. TIP: Lift up the bottom bunk and lay the suitcases flat underneath. This will free up the floor space. We also pre-packed a single bag ahead of time with everything we would need while on the train (pajamas, change of clothes, toiletries, etc). So once we packed the bags underneath the bunk bed, we didn’t have to dig through the bags for the rest of the journey. The train is beautiful. Clean, well stocked (a bottle of water for each paid ticket) in your room and a nice cafe car. There is also one towel per person on each bed. Once you’ve settled into your room, make your way to the cafe car for a late night dinner or snack. Seating can be limited, so arrive early if you have a large party. I don’t know that this is typical, but there was only one lady working in the kitchen and taking orders. She ended up taking everyone’s order before she started cooking, so it was almost an hours wait for our food. However, the food was actually really good! I ordered a pasta dish and a sandwich. Both were wonderful. We got the meal to go and had a picnic in our cramped room. Waiting for the food to finish cooking for a late night dinner. -Bring extra pillows and blankets for the kids. Sharing a bed is already an adventure, no one wants to be fighting over the sheets. -There are a few power plug-ins, we always bring multi USB adapters to make use of them. -Request nets on the beds when you call the reservation line. It’s great for small children and even adults. You can take them off easily if you decide they don’t work for you. -FREE wifi! It was actually really good, enough for our son to watch some shows in the morning when he woke up (was ready to break out of the room) and we needed to pack up and be ready to depart. How did we fit two adults and one child into one sleeping compartment? So we aren’t the co-sleeping type of family. I thought about this part of the trip for quite a while, knowing that I would be the one sharing a twin bed with my son. Originally we thought he would sleep at the end of my bed, but then we realized that each bunk has two thin mattresses stacked on top of each other. This probably isn’t the safest, but we ended up taking a thin mattress off my bunk and placed it folded up on the floor of the cabin. 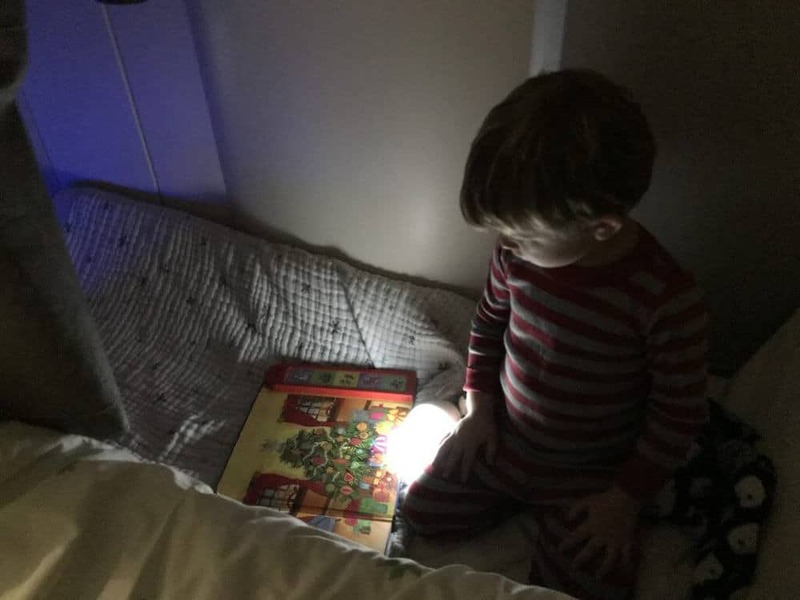 It was small enough to leave space for the door to open, but also enough mattress space for our son to curl up on the floor. We had packed an extra little pillow (travel size) and child’s blanket, so he was all set. My bed wasn’t as comfortable, but doable for one night’s sleep. Traveling with your pets? Want to bring your car along? Both can be arranged for an additional fee. See more details about that here. 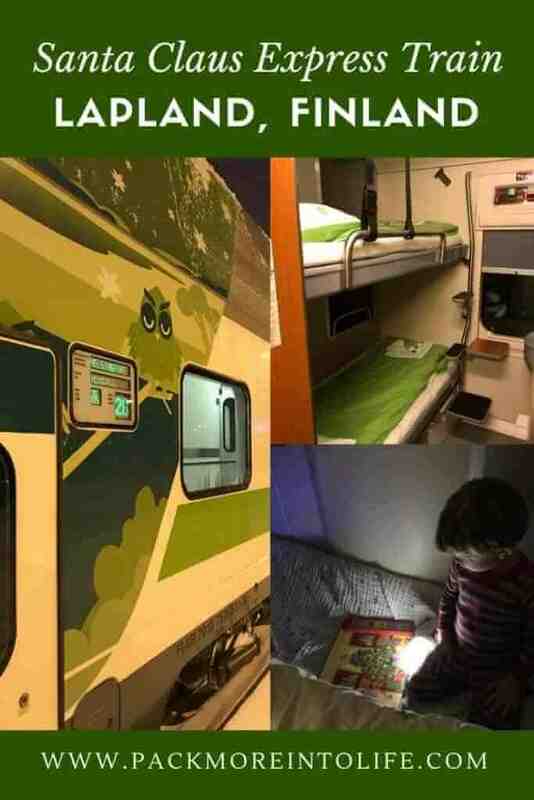 I hope I answered all of your questions about sleeping on the Santa Claus Express train in Lapland, Finland. Leave a comment below with any other questions or sharing your experience on the train. I’ve also got lots of great information about our stay at the Santa Claus Holiday Village in Lapland, Finland. Dog sledding, reindeer sleigh rides and more! Or perhaps you’d like some more travel inspiration, head to my destinations page to explore the map.